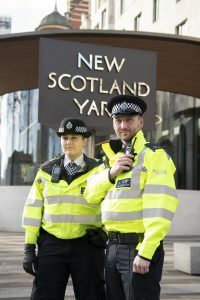 The Metropolitan Police Service have agreed to invest in Sepura SC20 and SC21 TETRA terminals. The Metropolitan Police Service (MPS) has selected Sepura’s SC2 Series of TETRA terminals to replace their existing fleet in an agreement forming one of the largest single orders ever received by the UK-based TETRA specialist manufacturer. The decision to purchase Sepura terminals was taken after an extensive trial with the devices across numerous sites with varied teams within the force. The force fleet will comprise both Sepura’s flagship SC20 terminal alongside its more compact but equally powerful stablemate, the SC21. The choice of terminal will be available to officers dependent on their operational requirement. This operational flexibility will be supported by a common user interface across devices ensuring that users will be familiar immediately with their allocated terminal. Sepura’s efficient battery management, combined with streamlined accessories across the Sepura SC2 Series range, will allow the force to save costs and reduce deployment time on a day-to-day basis. In addition, a bespoke software release has been developed to deliver specific functionality, supporting the operational performance of the Metropolitan Police. With future innovation possible through the AppSPACE software environment, the new terminals will help to drive operational efficiencies. In total the fleet will number over 32,000 terminals from the SC2 Series and SRG39000 mobile series, supplemented by Sepura’s extensive range of audio accessories. These will be deployed throughout 2019, with the first devices going live in May and all devices operational by December.